There are two easy options to consider for travelling out to the Alps: You can choose to fly with one of the numerous low-cost airlines that serve the local airports - Your transfer from the airport to resort is free - or you can self-drive in your own car and a discount will be given. Whatever you choose, getting to us is easy! Low cost airlines provide a cheap and flexible method of arriving in France in the shortest possible time and although we can't book for you, please contact us> if you’d like help finding flights that suit you. 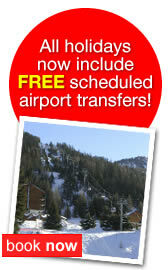 Airports for Valfrejus and La Norma are Chambery, Turin, Grenoble and Geneva. Please call us when you are ready to book for the current transfer schedule. Flights start as low as £60 per person return. We always endeavour to fit in with your arrangements and if you require transfers outside of these scheduled times or to other airports we will of course be delighted to help but please be aware that there will be a supplement dependant on the actual times and the number of people travelling. Feel free to call us> to discuss your individual requirements. Booster and baby seats are available but limited and carriage of your skis or boards is naturally, no problem. You can be assured that all of the SnowYourWay vehicles are equipped to deal with heavy snow and bad weather conditions should these occur and all our drivers have lots of experience of all driving conditions. Driving in France (whilst on the wrong side of the road!) is easy and the toll roads are rarely busy. Expect a driving time in France of about nine hours and tolls of approximately £70 each way if you use the motorway system. Please ensure that you abide by French law, which is now strictly enforced, and carry the appropriate mandatory equipment. Click here > for more information. If you choose to drive, let us know when booking and we can offer a discount on our published holiday prices as well as providing you with detailed driving directions for your journey across France. We will also provide our local resort telephone numbers should you require any assistance whilst travelling.